i.g. Burton opens up in the First Town and makes a First Donation to Beebe Healthcare! i.g. Burton and Company, Inc., a 5th-generation, family-owned and operated car business, purchased the Lewes Automall in August 2016. In its first 30 days of operation at the Lewes location, i.g. Burton, decided to make a generous donation to Beebe Healthcare’s Cardiac and Vascular Services. Charlie Burton, owner of i.g. Burton and member of the Beebe Medical Foundation Board, said, “Beebe has been the heart of this community for over 100 years and we wanted to make a gift that will truly help and save lives.” He cited Beebe Healthcare’s plans to add a new state-of-the-art, hybrid operating room, the first in Sussex County, at the Lewes campus, where cardiac and vascular procedures and surgeries will be performed, and also i.g. Burton’s plans to expand the existing cardiac electrophysiology and catheterization labs there where life-saving procedures are performed. These new operating and procedure rooms are part of Beebe’s upcoming expansion project and those to which i.g. Burton is contributing. “Our company believes in contributing to the community we serve and our gift towards this new capital expansion project will hopefully encourage other local businesses and individuals to join us today in giving to Beebe so it can continue to provide quality healthcare for all our families,” Mr. Burton added. This year’s famous Beebe Ball is earmarked to raise funds for Cardiac and Vascular Services and its expansion project. To learn more about ways to give, or how you can sponsor the upcoming Beebe Ball to be held on Saturday, November 19, 2016, at Nassau Valley Vineyards, please contact the Beebe Medical Foundation at (302) 644-2900, or go to beebemedicalfoundation.org. Pictured above: i.g. Burton and Company Inc. has made a generous donation to Beebe Healthcare’s Cardiac and Vascular Services. 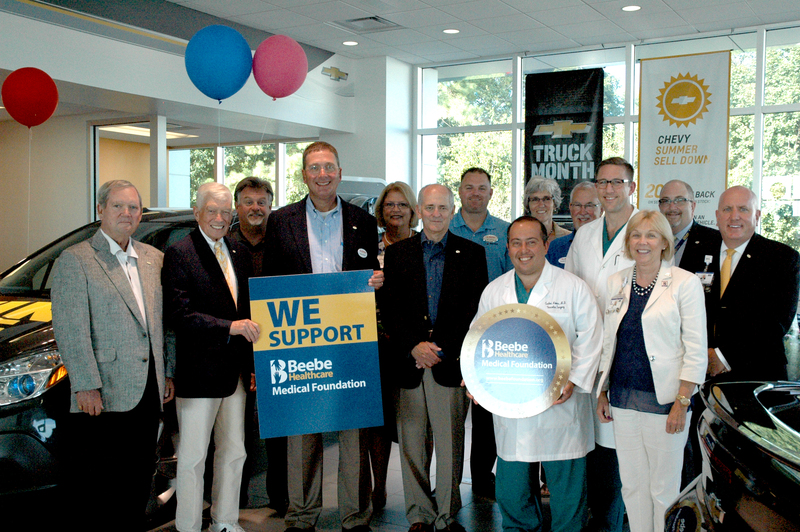 Pictured here, at the i.g.Burton location in Lewes, is, left to right: Tommy Cooper, Chairman of the Board, Beebe Medical Foundation; The Honorable William Swain Lee, Chairman of the Board, Beebe Healthcare; Pete Renzi, Director of Operations, i.g. Burton; Charles Burton, owner, i.g. Burton; Lynn Amey, MHA, BSN, RN-BC, Executive Director of Cardiac and Vascular Services, Beebe Healthcare; Jeffrey M. Fried, FACHE, President and CEO, Beebe Healthcare; MJ Lofland, Director of Sales, i.g. Burton; Dr. Carlos Neves, Beebe vascular surgeon; Diane Barlow, gift planning officer, Beebe Medical Foundation; George Schifferer, Director of Parts and Service, i.g. Burton; Dr. Sean Ryan, Beebe vascular surgeon; Judy Aliquo, CFRE, President and CEO, Beebe Medical Foundation; Rick Schaffner, RN, Executive Vice President and Chief Operating Officer, Beebe Healthcare; and Tom Protack, Vice President of Development, Beebe Medical Foundation. 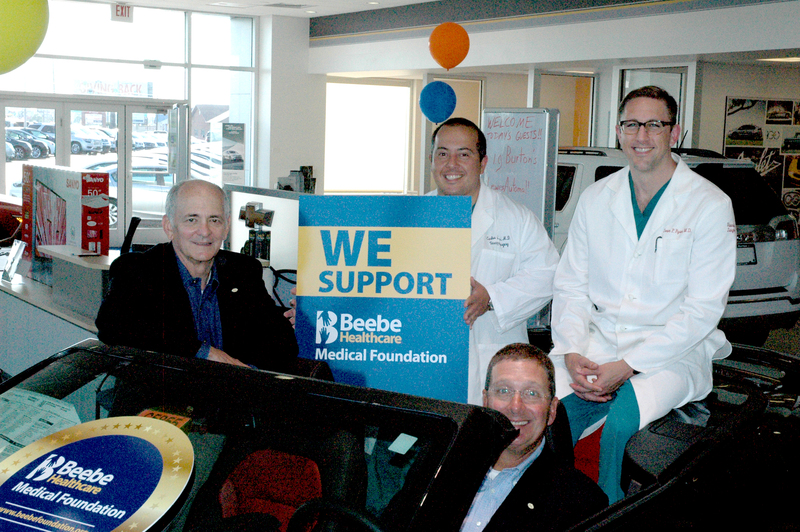 Pictured above: Jeffrey M. Fried, FACHE, left, President and CEO of Beebe Healthcare, sits in a new convertible at i.g. Burton with dealership owner Charles Burton at the wheel and Beebe vascular surgeons Dr. Carlos Neves and Dr. Sean Ryan behind. i.g. Burton & Co., Inc. is one of fewer than 40 dealerships in the United States to receive the Century Award from the National Automobile Dealers Association (NADA) for being in the retail transportation business for at least 100 continuous years. The company has locations in Milford, Seaford, and Lewes, Delaware, featuring Chevrolet, Buick, GMC, Chrysler, Dodge, Jeep, Ram Truck, Fiat, Promaster, BMW, Mercedes-Benz, Sprinter, Blue Bird Buses, and pre-owned vehicles. They are online at igburton.com.